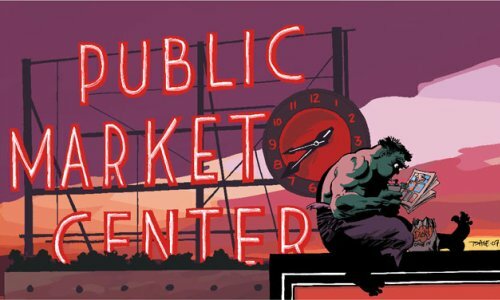 It's time for the sixth annual Emerald City Comicon report. Has it really been six years now? Six years already? I went to the first year, where I had a short day but had a lot of fun. I went the second year and met Kurt Busiek for the first time, as well as a ton of other people who've become once-a-year friends. I went the third year, but only the second day because of work, and met the folks behind Dorothy of Oz AND left a phone message for Aaron Williams. In 2006, the fourth year, I brought Torvald along for the first time and trolled a lot of people as seen in my four part convention report. 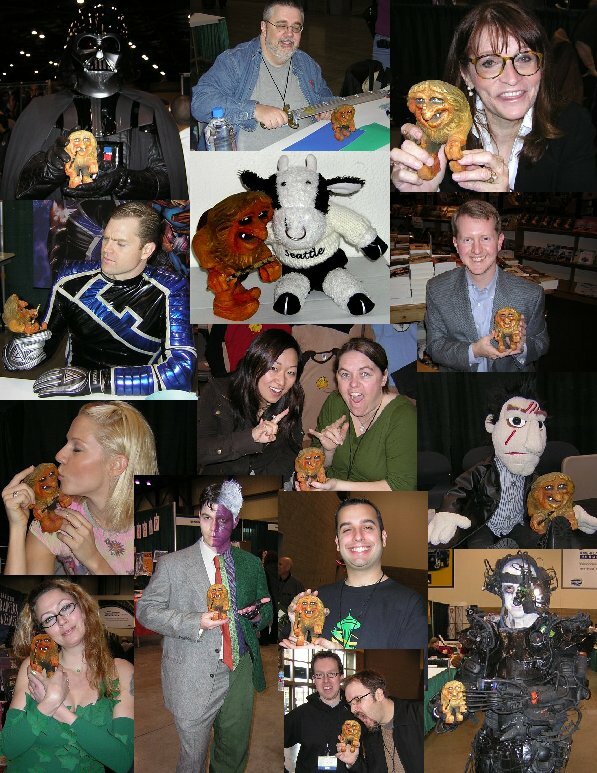 Last year, the fifth year, I trolled Margot Kidder and Peter Mayhew, and wrote another very long convention report. This year, instead of being in a Stadium Concourse or Exhibition Hall, the con was held at the Washington State Convention and Trade Center in downtown Seattle. While I have visited the building recently, the last time I had attended an event there was about 20 years ago. It's changed a bit since then. For me, this was like visiting a brand new place with a lot of familiar faces. Although taking a bus down to the center looked like it might be slightly cheaper, I ended up deciding to drive for several compelling reasons. The biggest reason on Saturday was my "twin" sister's work schedule, which had her working the morning shift on Saturday, coming to my house for breakfast and then immediately going to the con with no sleep. Bringing the car meant she could nap in a fairly quiet environment if she needed it. It also meant we could pack a cooler with lunch and snacks. Which we did. As for Sunday, it was the ability to bring along food that made me stick with the car. Buying food at the con itself is always a dodgy proposition (expense-wise), so I didn't want to risk it. As I was checking the list of guests to figure out what to bring for signing, I spotted a name that I was certain I had misread. In fact, I read the name about four times before I started to accept that, yes, this was the same guy who drew The Atlantis Chronicles. Esteban Maroto. 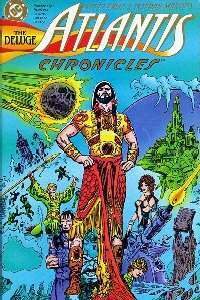 One of the first comic book series I hunted down to read. Still one of the finest comic book stories I've ever read. And the artist was coming to Seattle! I gibbered. I ran around looking for my copies of the books. I called my sister to squee (and ask how her Spanish was, as my understanding was that Esteban speaks no English). I eventually calmed down and finished my other preparations for the con, including making my business cards and Torvald's cards. I slept very little the night before the con. I am rarely this excited, but it felt like the night before Christmas used to when I was a child. I got up nice and early and got ready in record time. 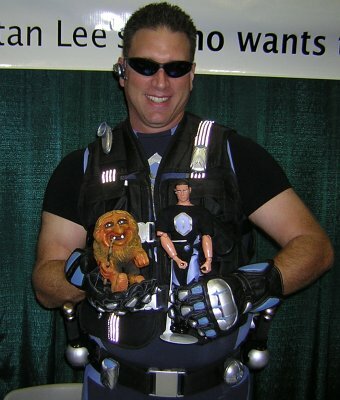 I set up a post to see if the delayed blogger posting works, that would post when I got to the con. Then I needed only to wait for my sister, Lisa, to finish work and arrive. The clock ticked on. She was supposed to call about 8am to let us know she was on the way up. 8am passed. Then 8:15. I began to panic. I called her at 8:20 and learned her boss had decided to give her some extra last minute stuff to do, but she was almost done, don't worry Laura. I shouldn't have worried. She arrived in plenty of time to gobble down pancakes for breakfast. We left by 9am, which was my original goal. The drive down was utterly uneventful. The directions I downloaded from the WSCTC website were perfect. We got a good spot, and loaded up our bags and headed in. Torvald was strapped against my waist in a belt purse, with the cards I made also in the main pocket. My con bag with sketchbooks and mini-clipboard was on my shoulder. Lisa offered to carry some of my books, so had my copies of The Atlantis Chronicles and Wondermark. We went from the parking garage, up an escalator to the fourth level, and went to claim our badges. Then we went to the line. We weren't very far back, and the line wasn't out in the cold like in previous years, but in a nice dry concourse. The fans were squeezed in by the convention center staff, but no one seemed to mind much. The woman behind us in line mentioned that this trip was her Mother's Day present. Then we were in! The doors opened and the crowds rushed. Lisa and I started toward the freebie table, but as usual gave up and instead headed to table 520. Where the Spanish artists were set up. I was the first visitor of the day, there before they'd finished setting up, talking with Esteban's translator and practically gleaming with joy. Lisa, realizing that I'd never calm down enough to think of it, pulled out my copies of Atlantis Chronicles for Esteban to sign. He signed all seven issues. I squeed. I trolled him, first trolling of the day. He seemed amused. I gave him a "You've Been Trolled" badge. His agent and translator both took my business cards and suggested that there were some Atlantis Chronicles pages I might be able to put up on my Aquaman website to help Esteban sell. They said they would be in touch. 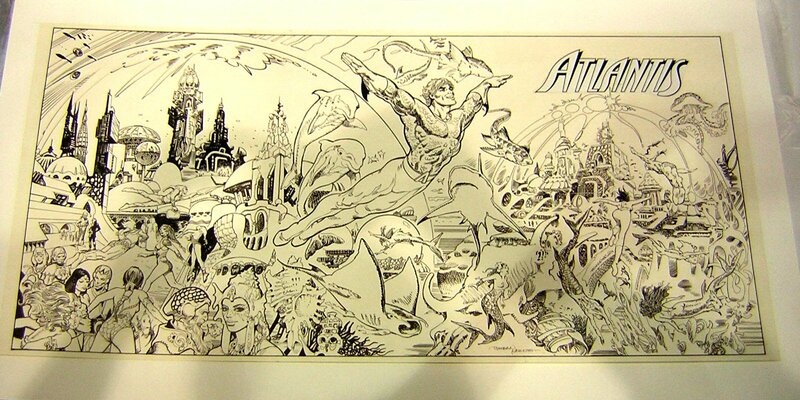 Esteban had a piece of artwork out on the table, not really the Atlantis Chronicles but a promo piece with Aquaman. Knowing I didn't want to hear the answer, I asked if it were for sale and for how much. The answer was yes, $1000. Had I had a spare $1000 the piece would have been mine. But I had only enough money to buy the books that Eric and I had pre-agreed on. I asked if I could take some pictures of it, which was allowed. You should be able to see the picture below this paragraph (click for a larger version). I'm sorry about the shadows, the light was harsh. After seeing Esteban, Lisa tore me away to go visit Pia, since I had a gift for her in my bag. Unfortunately, Pia hadn't arrived yet, so we headed down to the media tables to visit the "Who Wants To Be A Superhero" stars and troll them. I had a printed montage of people I've trolled in the past, and was sure to include previous winner Feedback in the image for this year. I showed it to each of them before I trolled so they knew what I was doing. I first met Nell "Fat Momma" Wilson, who was my favorite on the last season. I thanked her for her courage in going through those tests, knowing that I couldn't have managed. Then I trolled Trisha "Ms Limelight" Paytas. Jarrett "The Defuser" Crippen was busier, but we managed to troll him as well. Lisa's main goal of the con was to meet Dave Kellett and buy all his books. As I wanted to visit Brad Guigar and buy all his books, this worked out well for both of us. So our next stop was the Halfpixel.com booth! I'd met half the people at the booth. Scott Kurtz and Brad Guigar were both trolled last year. I hadn't, however, trolled Skull the troll! So Skull got trolled. Then I purchased all three books from Brad, and asked really really nicely for an Aquaman sketch if he wanted to try. In the meantime, Lisa was buying all of Dave's books. Knowing my... "love"... of pugs, she also bought me one of Dave's pug buttons. Brad did a sketch, reluctantly, and then I trolled the other half of Halfpixel, Dave Kellett and Kristofer Straub. An aside here. I regularly read PVP, Evil Inc, and Sheldon. But somehow, I'd never even heard of Starslip Crisis. Kristofer Straub was a complete mystery to me. I didn't want to leave him out, so I trolled him, and picked up his flyer. Saturday night, before I crashed, I checked out the webcomic and after giggling aloud while reading several strips, added it to my RSS reader. I will probably be buying his books next year. This is why conventions are so important! 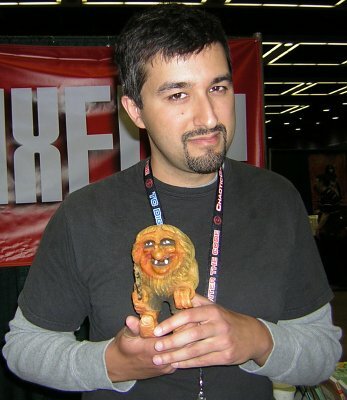 After I'd trolled Halfpixel, we heard an announcement that Wil Wheaton was now signing at his booth. As Dave was still autographing Lisa's books, I abandoned her to get in the line. Good thing, too, as it was a LONG line that grew immensely after I got in it and moved fairly slowly because Wil gives everyone plenty of attention. I hoped that Wil would still have a copy of "The Happiest Days of Our Lives" on hand, because I'd been waiting to buy it. I'd also tweeted Wil to warn him about the troll. I stood in line until Lisa came up to say hello. She then wandered off while I waited. Maybe it was the crowds. Maybe it was the lack of movement. Could've been the air in that section of the room. I had a minor anxiety attack and had to crouch down to avoid falling over in a faint. While I was crouching, I noticed a friend walking by and called to her. She looked around for the voice, not seeing me since I was down low. I stood up and she came over to chat. I'm not sure I made much sense, as I wasn't feeling well at all. Eventually Lisa came back and my friend wandered off to find someone she was trying to meet. I think Heidi Meeley also walked by at this point, but I'm not sure. The guy in front of me in line was nice, and helped me regain focus (fucos?) by talking about his gift for Wil (a Lando action figure). Eventually we made the front of the line, and Wil laughed heartily when he saw the Lando figure. He had stacks of books left, so I wasn't worried anymore about getting my copy. When it was my turn, I trolled Wil (as seen here) and bought a book. Wil mentioned that he'd seen the tweet. He inscribed my book "To Laura Don't Feed The Troll! Wil Wheaton". Pleased and happy with my purchase and picture, I collected Lisa and we decided to visit the car and drop off the many books we'd already gotten. On the way to the car, we ran into Magneto. 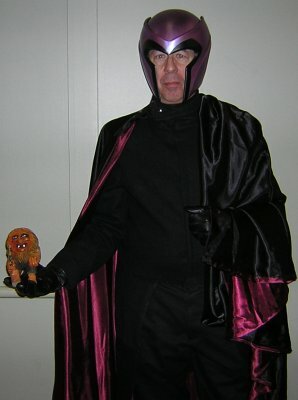 His costume was excellent, but the guy himself really looked like Sir Ian McKellan. It was amazing. I managed to get him to pause for a Troll picture. Then it was off to the car to plot our next move. We dumped off all our extra books, each ate a snack, and decided to visit Aaron Williams next. And that's where I'll leave off for the moment, with Lisa and I standing in the parking garage eating snacks out of the trunk of my car and plotting our next evil move. Emerald City Comicon reports: 2003, 2004, 2005, 2006: part I, part II, part III, part IV, 2007: part I, part II, part III, part IV.